How to Make Armadillo Crafts and Learning Activities to Reinforce your Armadillo Unit Studies Great Homeschool Resources for Teachers! 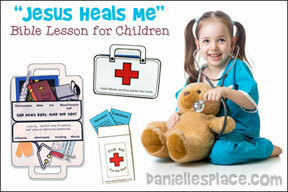 Use this craft with your armadillo homeschool unit study to reinforce your lessons. This craft comes in two different styles and three different sizes. The first style consists of two parts; the head and body. The ears and head are folded and glued to the body to make it standout from the arm. The second pattern has only one part and sits flat on the arm. 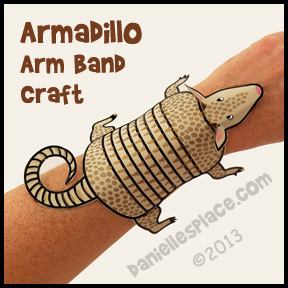 The armadillo pattern is attached to a band that is fastened around the arm. 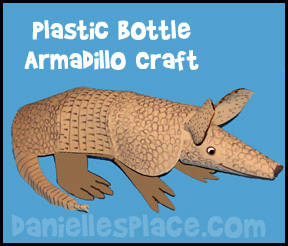 You can also glue the pattern to a paper towel or TP tube to make an armadillo toy. 1. Print out the patterns onto card stock by clicking on the links below the pictures. 2. Cut out the patterns. 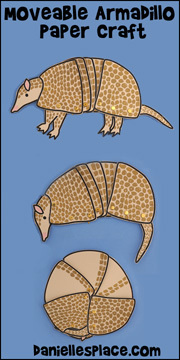 To make the 3D armadillo cut out the head and fold the ears up. Fold the sides of the head down. Glue the neck to the armadillo body. 3. Cut long strips of paper for the band and glue the armadillo to the band. Tape the band to the child's hand. 4. To make the band removable punch holes in the band and secure with a string, or use Velcro tabs. 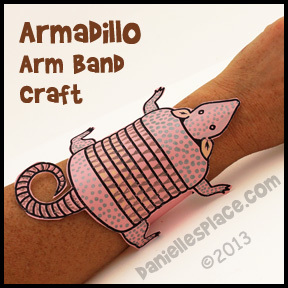 This is a great craft to use with your Homeschool unit studies about armadillos. Read books about armadillos and then make the armadillo to reinforce what your children have learned. 1. Print out the pattern onto card stock. 2. Color the parts and cut them out. 3. Glue the front and back legs to the sides of the tubes. 4. Glue the shell over the top of the tube to cover the legs. 5. Cut the slits at the dark lines up to the eyes. Make creases in the head pattern on the dotted lines. Fold them all down. Glue the head at the slits to make darts. Glue the head to the body. 6. Fold the tail down the sides and cut slits on the sides. To finish glue the tail to the body. 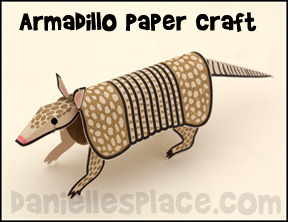 Read books about armadillos (See below) and then make this craft to reinforce your homeschool lesson about Armadillos. 1. Print out the shell, head, leg and Ear Pattern. 2. Cut out all the patterns. Place the shell, head, and ear pattern on fun foam. Trace the patterns onto the fun foam and cut them out. Place the leg pattern on a piece of paper that has been folded in half. Trace the pattern onto the folded piece of paper and cut it out. Unfold the paper and place it on a piece of fun foam. Trace it and cut it out. 3. Glue the leg pattern around a 20 oz. plastic bottle so that the legs are hanging down on one side of the bottle (See the picture.). 4. Cut the four slits on the shell pattern. Make four darts in the shell by placing glue along the under side edge of each slit. Bring the edge of the slit over the meet the dotted lines. Press until the glue sticks. Do each dart one at a time. 5. Glue the shell over the legs so that just the legs show. (See picture.) The front of the shell, the part that has the curve that goes inward, should be glued to the top of the bottle where the head will be attached. 6. Glue the head pattern together to make a cone shape. Cut the slits by the nose. Push the fun foam under the nose in towards the center of the cone and bring the nose down over the fun foam that you pushed in. Glue it down. Glue the head to the top shell by placing some glue on the tab that sticks out from the head. Place the head over the top of the bottle so the tab is under the front of the shell. 7. Place a tiny bit of hot melt glue in the bottom center of each ear. Fold the ears in half and hold the fold down until the glue holds. Glue the ears to the head where marked. 8. Cut a tail from the left over fun foam. 9. Use a marker to draw on the mouth and eyes. To finish draw stripes and circles on the shell and head. 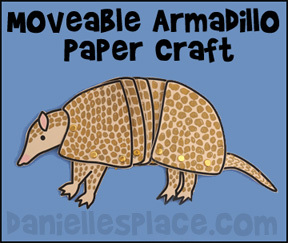 Use this craft to learn about armadillos. Have your children draw nine bands in the center of the armadillo to make a nine-banded armadillo famous in Texas and other US states. Read Armadillo Rodeo by Jan Brett about an armadillo named Bo and his great adventure in the Texas countryside and at the rodeo. Have your children study the pictures and discuss how the landscape differs from their own. Visit the author's web site, to see a great Armadillo Made from a Milk Carton. Did you know that not all armadillos can roll into balls? The three-banded armadillo is the only armadillo that can do this. 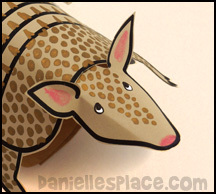 Your children will love learning about armadillos using this moving armadillo craft. The head, tail, and legs tuck in to form a ball just like real armadillos. 1. Print out the patterns onto card stock and cut them out. Printable patterns are available to members. 3. The middle pieces of the armadillo's body are numbered from 1 to 3. 4. Punch a hole at Circle A on the front part of the body and the head, and attach the head to the front with a brass fastener at Hole A. 5. Punch a hole at circle B on the front part of the body and on the front legs, and attach the legs to the body with a brass fasteners at Hole B. 6. Punch a hole in the a circle on the front part of the body and body Part #1 and attach body Part #1 behind the front part of the body with a brass fastener at the punched holes. 7. Punch a hole in Circle B on Body Part 1 and Body Part 2 and attach them with a brass fastener at Circle B. 8. Punch a hole in Circle B on Body Part 3 and attach it behind Body Part 2 at Hole B. 9. Punch a hole in Circle C on Body Part 3 and the back of the armadillo and attach them with a brass fastener. 10. Punch a hole in Circle D and the back legs and attach them with a brass fastener. 11. Punch a hole in Circle E and the tail and attach them with a brass fastener.